“During his ten years as principal of Boston’s Solomon Lewenberg Middle School, Thomas P. O’Neill Jr. and his faculty proved it. The pride of Boston’s junior high schools during the 1950s and early 1960s, Lewenberg subsequently suffered the ravages of urban decay, and by 1984, with the lowest academic record and Boston teachers calling it the “looney bin” instead of Lewenberg, the school was earmarked for closing. But first, Boston officials would give it one last chance. The reins were handed over to O’Neill, an upbeat, first-year principal and former high school English teacher whose experience there had taught him to “sell” the pleasures and importance of reading. The first thing he did was abolish the school’s intercom system. (“As a teacher I’d always sworn someday I’d rip the thing off the wall. Now I could do it legally.”) He then set about establishing structure, routine, and discipline. “That’s the easy part. What happens after is the important part–reading. It’s the key element in the curriculum. IBM can teach our graduates to work the machine, but we have to teach them how to read the manual.” In O’Neill’s first year, sustained silent reading (see chapter 5) was instituted for nearly four hundred pupils and faculty for the last ten minutes of the day, during which everyone in the school read for pleasure. Each teacher (and administrator) was assigned a room–much to the consternation of some who felt those last ten minutes could be better used to clean up the shop or gym. “Prove to me on paper,” O’Neill challenged them, “that you are busier than I am, and I’ll give you back the ten minutes to clean.” He had no takers. Within a year, critics became supporters and the school was relishing the quiet time that ended the day. The books that had been started during SSR were often still being read by students filing out to buses–in stark contrast to former dismissal scenes that bordered on chaos. The next challenge was to ensure that each sixth-, seventh-, and eighth-grade student not only saw an adult reading each day but also heard one. Faculty members were assigned a classroom and the school day began with ten minutes of reading aloud, to complement the silent ending at the end of the day. Soon reading aloud began to inspire awareness, and new titles sprouted during SSR. In effect, the faculty was doing what the great art schools have always done: providing life models from which to draw. In the first year, Lewenberg’s scores were up; in the second year, not only did the scores climb but so, too, did student enrollment in response to the school’s new reputation. Three years later, in 1988, Lewenberg’s 570 students had the highest reading scores in the city of Boston, there was a fifteen page waiting list of children who wanted to attend, and O’Neill was portrayed in Time as a viable alternative to physical force in its cover story on Joe Clark, the bullhorn- and bat-toting principal from Paterson, New Jersey. These are the stories that make me continue to read aloud to children. It is THE single most important thing I do in my classroom. Children love it, read on their own throughout the day, and excel in school. Not only am I growing readers, I’m opening the door to the world for them. And, they jump in with both feet. This entry was posted in chapter reading, Early Education, Jim Trelease, picture books, reading, reading aloud, storytelling, Teaching young children and tagged chapter reading, children's books, Early Education, Jim Trelease, language development, literacy, reading aloud, The Read-Aloud Handbook. Bookmark the permalink. Every teacher needs to realize the truly magical effects of silent reading and especially, reading aloud to students. Bravo to your wonderful Mother! Oh, how she made a difference by reading aloud to her students. She would like The Read Aloud Handbook (you would, too). Thank you for sharing her story. Big wow! SSR is necessary. I am so glad you understand I am enhancing and supporting you and of course, Mr. Trelease. I have the utmost respect and fondness for so many of your teaching practices, Jennie. Bravo to Mr. Trelease and to you and all the teachers who encourage reading. My fondest memories of school are when the teachers read aloud to us. I just reread Hans Brinker or the Silver Skates, a book our teacher read aloud to us all those years ago. I felt the same excitement as I raced along the canals of Holland with the children. Thank you, Darlene! I haven’t read Hans Brinker since I was a child. Your story brings good memories. Children are always excited at read-aloud. It is the best part of teaching! I have never heard of the gentlemen you mention, but they sound to me like the best kind of educationalists. If you were inspired to follow that lead, then their work was worthwhile indeed. Thank you, Pete. He is a trailblazer in reading aloud. He visited my classroom! Probably the best moment in my teaching career. I am included in the new version, too. You are welcome, Susan. It is an amazing story. Yes, SSR makes a big difference. Nice article, yay for reading aloud! I’m always telling library patrons (in reference to their children) that a love of reading is the best gift for their children, so helpful in every subject they may ever want to pursue. Thank you, Susan. 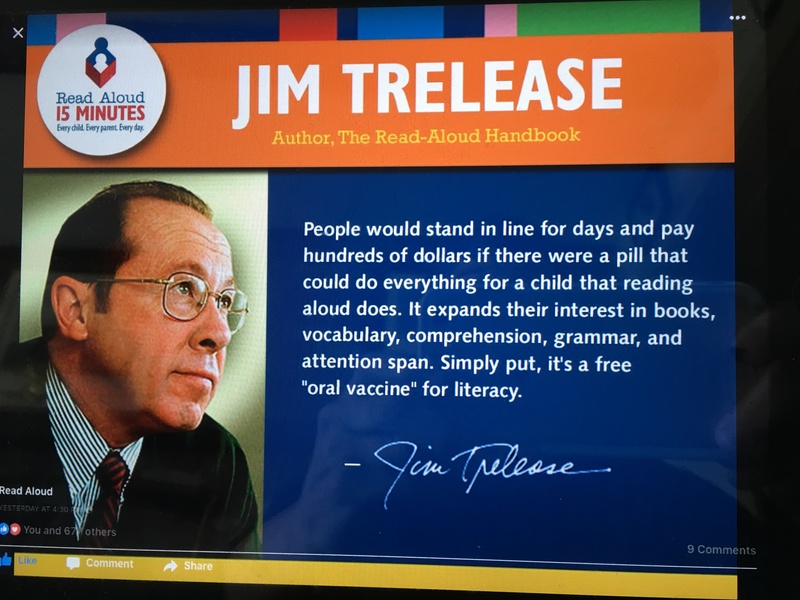 Jim Trelease’s words and stories are the most important to reading aloud.